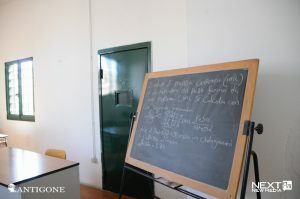 The main aim of prison school in Italy is to teach literacy: where in 1958, at the time of the establishment of the Prison Schools, it was almost exclusively Italians who had to learn to read and write, today’s literacy courses are mostly addressed to foreign prisoners. The school is also an instrument of education and social emancipation. The Constitution establishes important principles in the field of education and, in particular, Article 34 recognizes education as a fundamental right. The reform of the penitentiary system, enacted by law n. 354 in 1975, in article 15 recognized work, religion and education, alongside cultural, recreational and sports activities, as essential elements of the penitentiary treatment. The principle of the individualisation of prison treatment was also ratified; it has to be tailored according to the needs of each prisoner. Article 19 established that vocational education and training should be available in prison, organized in accordance with the forms and methods provided by the Ministry of Education. The same article, in the third and fourth paragraphs, included the possibility of setting up secondary education, as well as the possibility to access university. In general, according to the above mentioned law, education should be promoted at every level as much as possible, keeping in mind the peculiar reality of the prison system. Courses are carried out by the Provincial Centres for Adult Education (hereinafter CPIA), and have the same autonomy of other educational institutions, their own staff, the same administrative bodies and maintain a close connection with local authorities, employers and professionals. Second Level courses (high secondary school) are those provided by technical institutes, professional institutes and artistic high schools. They are provided by the same educational institutions that provide these courses outside prison. In the prison administration statistics – December 31, 2016 – we see several abbreviations that indicate the type of courses. CILS (formerly Literacy) refer to the Courses for Language and Social Integration. The acronym CA (former Primary School) refers to the Cultural Literacy Courses of Primary School; CSI are Second Degree Primary School Courses and CS are Second Degree Secondary School Courses. Let’s take a look at the information and data collected by the Antigone Observatory in 2017. Among 87 institutions we visited, 4 of them lack spaces exclusively dedicated to school and training. In Fermo prison, the lack of space makes it difficult to complete any kind of course. For this reason, courses are aimed at the acquisition of credits for high school but they do not issue any diploma. In Bologna “Dozza” prison, in Emilia Romagna, which currently hosts 769 inmates, in school year 2014/2015 the project “Skills and credits for prison education” was launched for detainees expected to stay in prison for a short period of time, to make possible for them to acquire skills that could be spent on subsequent professional or training paths. The data collected by the Antigone Observatory shows other interesting facts. First of all, the first five regions with the highest percentage of school enrolments in prison are Lombardy (36.7% of the prisoners), Calabria (35%), Lazio (25.7%), Umbria (24.1%) and Piedmont (23.1%). The last 5 are, in decreasing order, Abruzzo (13.0%), Sicily (11.9%), Valle d’Aosta (9.4%), Campania (5.5%) and Molise (4.3%). The situation of prison education seems to get worse when we look at the south: Marche, Sardinia, Basilicata and Puglia regions do not reach 20%, a decrease that is also confirmed if we aggregate the regions, northern Italy settles at 21.5% whereas centre and southern Italy at 18%. According to prison administration statistics other reflections are also possible. We can see how the percentage of inmates who pass the class increases moving towards higher levels of education. 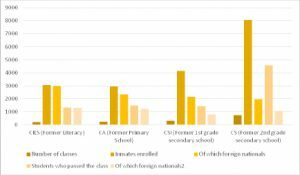 The trend of the presence of foreign inmates in the classes is the opposite: they represent 88.5% of those enrolled in the 387 literacy courses, and 90.8% of those who passed, but this percentages falls to 50.6% in elementary school (59 % of those who passed), 26.8% in middle school (27.5% of those who passed). In high school the percentages drop again: 20.1% of the first years (19.3% of those who passed), 18.6% in the subsequent years (20.1% of those who passed) and 17.9% at the moment of the final license ( 15.1% of those who passed). In general in prison schools non nationals represent 48.8% of those enrolled and 44.1% of those who passed. Although university education inevitably ends up involving a small number of inmates, since the ’70s it seemed clear that it was necessary to make this choice available also in prison. University education in prison meets some limits though: the first subjective limit is undoubtedly the very common lack of education prerequisites among prisoners. But there are also material limits depending on the prison facilities, such as the lack of libraries or study areas: usually university students in prison share a cell with other inmates who do not study and have other needs and other habits during the time they spend together in their cell. There are very few prison facilities in which students are accommodated together in order to provide them the most suitable environment during their studies. In southern Italy there are only 3 penal institutions, one of which is exclusively female (Pozzuoli), that grant access to Higher education. In the economy of this article it is impossible to retrace all the experiences of the PUPs (Poli Universitari Pentienziari – Prison University Wings). However, some of them deserve mention. The one in Turin is the first and the oldest in the country, its foundation dates back to 1998. It accommodates only male inmates. Currently it hosts 25 students. In Tuscany there is another PUP established in 2010 thanks to the Memorandum of Understanding between the Region, the Penitentiary Administration and the Universities of Florence, Pisa and Siena. The Tuscan PUP is active in the prisons of Prato (37 students), Pisa (7 students) and in San Gimignano. Among this only Pisa hosts women too. The Tuscan PUP also supports students detained in Arezzo, Livorno, Sollicciano and Volterra, but in those facilities there are no special wings for the students. Looking at the data on enrolment, both in University prison wings and in other prisons, the majority of prisoners (499, of which 15 women and 74 foreign nationals) choose political and social studies (26.7% of enrolment), slightly less than in 2016. Second place belongs to literature (22.6%) with an increase of almost 5% compared to the previous year. Then there are legal studies (17.4%, -2.6% than 2016). The agricultural sector in 2017 stood at 9.6% (​​stable compared to 2016), statistics and economy at 6.4% (in 2016 at 4.7%). 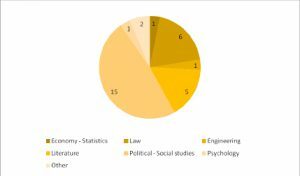 The sectors whose percentages are around 1% and which remain fairly stable between 2016 and 2017 are: computer science, engineering, linguistics, mathematics-science, psychology, geology and biology. Less than 0.5% of the students are in the chemical-pharmaceutical, medical or architectural sectors. Just 3% of students are women (in 2016 they were 2.6%), while 14.8% are foreigners. There are no women, however, among the graduates of 2016 and 2017, while 46 men obtained the title in 2016 and 31 in 2017. In conclusion, from this analysis on the data of those enrolled in a university course, it appears very clearly the small number of participants in higher education in prisons. The numbers concerning women are even more worrisome. This last fact depends on the great disproportion that exists between male and female detainees, but also on other elements that are probably interconnected: on the one hand, the largest percentage of female prisoners belonging to the most disadvantaged social groups and consequently with a generally lower degree of literacy and, on the other, their shorter sentences (Pastore 2017, page 92). However, even among the male population, the low literacy rate, usually linked to their belonging to the most disadvantaged groups, makes it difficult to own the minimum requirements (the high school diploma) required for enrolment to the University. From official data we know that in 2017 out of a total of 57.608 prisoners, only 550 had a university degree, 4,011 a high school diploma, 569 a professional school diploma.